Dreams of tropical paradise are inspiring trends across fashion and homeware. It’s only natural that the theme would spread to visual merchandising. Shop fronts enticingly decorated to remind the shopper of happier times on holiday. The visual merchandising look has been implemented by high-end fashion houses such as Fendi, right down to the low-cost high-street favourites Primark. The design shows no sign of fading this summer. Get the look: palm trees, pineapples, indoor plants, pink, blue, flamingos and other tropical birds. The minimalist, back-to-basics concept store has been a real favourite with emerging brands for the last few years. It’s a look that appeals to a younger, ‘arty’ demographic. Whilst the aesthetic appeals to a much narrower audience, it offers a brand a much more distinctive visual merchandising look. Particularly when compared with the flashy designs of many high street stores - it’s easy to position your brand as one that is focused on the integrity of your products through a laid-bare visual merchandising display. COS and Acne Studios are two great examples of brands that have used a minimalist in-store design to complement their brand values and products. Get the look: white - and lots of it, dynamic lighting and maybe a touch of post-industrial looking furniture around the store. 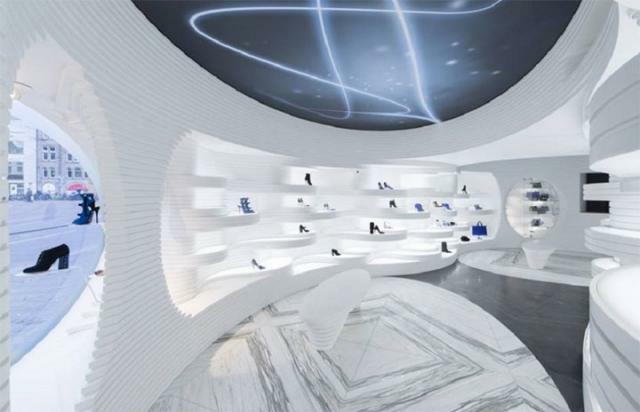 Futuristic in-store displays have long been a popular look for luxury fashion brands such as Alexander McQueen. The aesthetic can reflect brand values which seek to challenge traditional players and offer something innovative. Unique shapes such as curvy or streamlined customised fixtures around the store create the feel of the future. Many stores also implement technology to complement the design theme whilst also enhancing the in-store experience. This particular visual merchandising strategy is not cheap to implement as it requires custom designs and costly materials. It is, therefore, a look that is much favoured by medium-sized to global brands. Get the look: silver, colourful lighting and streamlined fixtures. Being aware of the latest designs in visual merchandising is a great way to stay ahead of competitors and offer your customers a shopping experience that is sure to delight. Of course, all trends must be approached with a degree of caution. It’s important to reflect trends in your interior designs only when they are in keeping with your company ethos and the tastes of your target market. An understanding of your customers and the kinds of the visual merchandising they respond well to is key. The most successful in-store displays are those that connect the product and brand with the theme.